Agro-ecology We should always bear in mind that the root system of banana is superficial and easily damaged by cultivation. To improve nitrogen content, organic matter, and reduce soil hardness, plant 2 rows of Canavalia, (Canavalia spp.) spaced 60 cm apart between rows of banana. Avoid planting within 1 meter of the banana plants. Uproot at early pod formation and leave plant residues on the soil to decompose slowly (CIAT Africa, 2003). 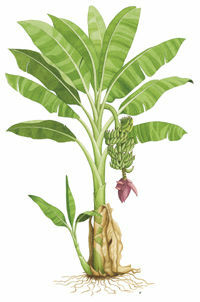 Cover crops like Centrosema and Indigofera have been found to be toxic to banana. Pueraria and other climbing plants are not advisable in a high density crop (Samson, 1989: p. 166). Banana needs large quantities of nutrients. Nutrient removal by banana plants is about 30 t/ha; which amount to 50 kg N, 15 kg P, 175 kg K, 10 kg Ca, and 25 kg Mg. In home gardens, the application of manures and compost is recommended together with 0.25 kg of Urea and Muriate of potash every 3 months for each stool (CABI, 2000). Any kind of green manure, animal waste, crop residues can be used as a basal fertilizer for banana. To apply manure (kg/clump- dry basis); 3-5 kg poultry dung; 5-10 kg cattle and other animal manures; 7-10 green manure are the recommendations. The organic materials should be spread 30 cm away from the clump base but within 1 meter from the clump and lightly mixed with soil. Take extra precautions in using animal manure as banana a fertilizer. Manure promotes the occurrence of banana weevils (FADINAP, 2000: pp. 100-101). Fertilizer recommendations based on soil analyses are the very best chance for getting the right amount of fertilizer without over or under fertilizing. Field sanitation is very important for keeping pests away. Cutting the infested plant and dumping it into the field serve as a breeding ground for banana weevil. Banana crop residues can be used as mulching materials to conserve moisture but only when pests and diseases are not present. The National Research Center for Banana (NRCB) develops stem weevil vaccine a formula for treating the stem weevil disease in banana. The commercial formulation, Banana Stem Injector, is pierced into the pseudostem at least 3-4 times during its lifecycle to save the crop (Revathy, 2001). Johnson, A.; Ives, C. (2001): Biotechnology inventory of ASARECA priority crops. Agriculture Biotechnology support Project, Michigan State University, USA. PCARRD. (1988): Philippine recommends for banana. Technical Bulletin Series No. 66, DOST, Philippines. Revathy, L. (2001): NRCB develops stem weevil vaccine. Business Line. Financial Daily from the Hindu group of publications, Coimbatore. Samson, JA. (1989): Tropical fruits. 2nd edition. Longman Singapore Publishers. Singapore.